‘As with all my works, while I have a general idea of its direction before I meet people, the outcome is always a result of what is mutually established. What transpired from my conversations and later taped discussions with Pat Purdy, was the great importance the wasteland had that lay directly adjacent to the estate….As a result of walking around the wasteland with Pat Purdy and discussing what she did there, I came to realise the central role building camps had for the teenage youth living on the estate. A primary activity in the camps was glue sniffing, a can of Evostick being heated up on a small fire placed amongst a ring of car seats, or discarded tyres. After a number of meetings with Pat Purdy, when I photographically documented her environment on the estate and made a number of tape recorded discussions, the structure of the piece emerged. The work is divided equally between the deterministic pressures emitting from the estate, and the wasteland, which is seen as the context for resisting those pressures by creating a counter consciousness. Having developed the basic structure I went back to one camp that Pat Purdy was particularly associated with, photographically documented it, and then took away all the discarded objects that I could find there. Instead of, as in earlier works in the 1970s, trying to create a Symbolic World for the audience that was slightly removed from their own reality so that they could make freer conceptualisations by being detached, I felt that current tensions required a more immediate confrontation. 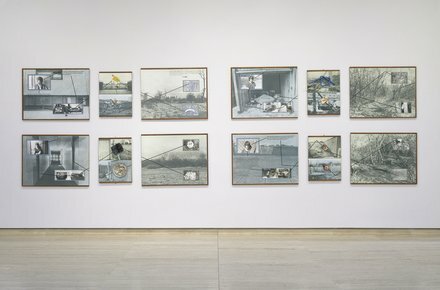 I therefore decided to embody the collection of objects found in the camp directly in the work, and to ask Pat Purdy to write her own quotations straight on to the photographic panels connected with the wasteland. A number of sessions were arranged at my studio, where Pat Purdy wrote her quotations and directed what objects and photographs I should use in the piece. The process of making the work took nine months, and was only finished when Pat Purdy finally gave it her approval.